Ended the season catching brookies with big-flaked snow falling to the tune of 3 inches of accumulation. Cedars, tamaracks and spruces are beautiful when they’re covered in snow. Well, closing day should have been Sunday if I wanted to end on the highest note. The front that came through Sunday afternoon changed things dramatically and Monday saw temps 20 degrees colder, strong northerly winds and full sun. Still caught an absolute pile of fish, but the really large ones were tough (impossible) for me to find and/or entice. 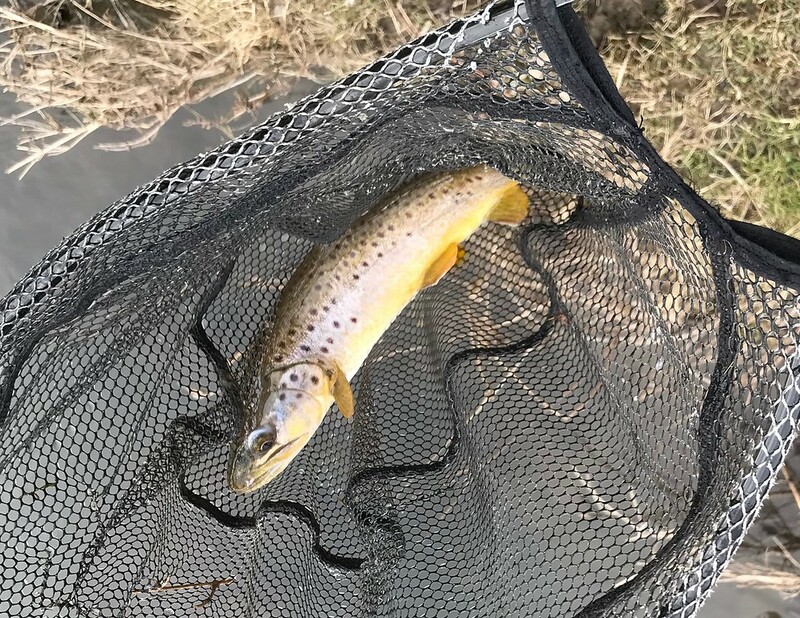 Over 50 to hand on the large stream that I started the day on – most around 11-13 inches with a few pushing maybe 16 - and then I decided to head closer to home so that I wouldn't have a long drive at the end. Was like early season/winter fishing as the bite was absolutely shut off when I arrived at 4:00. Only managed 3 small trout the rest of the day. This on two of my most productive streams of the season. The Trout Gods were teaching me humility at the end. All in all… a very good 4 day closing weekend with a pile of fish caught and a few special ones in the group. I'll post highlight photos at some point. The weather played havoc with my plans as I wasn't able to hit any of the large water nor most of the old favorites that I had saved for the end. Still cobbled together some good to great fishing on other waters. Have a couple of other trout things planned for later in the year, but for now… that's a wrap. Fantastic season and I'm actually glad it's over. Have a bunch of other things to attend to. Fishing in the snow in October. I suppose up north this isn't that uncommon. But as I was pulling my collar up yesterday against a 30mph wind with low 30s temps, I was pondering how many times I've ever had to consider wind chill factors this early in the fall. Brrrr. The new snow should start melting Friday and be in full flow by Saturday. Might be worth fishing early. In addition, with temps pushing 40, it’ll be amateur hour out there with the less hardy thinking it’d be a good day for a fish. Don't get me wrong… I'll make it work… but there are a couple of large streams that I was wanting to get to most of the fall and couldn't due to persistent high water. Was hoping to hit them this weekend and now I'll have to wait and see. Gurth, I'm just wondering if the trout will be in those smaller streams this time of year, temps notwithstanding. I wonder if they've been programmed to find bigger water, deeper holes, even though they could take advantage of the smaller water because of the temps. 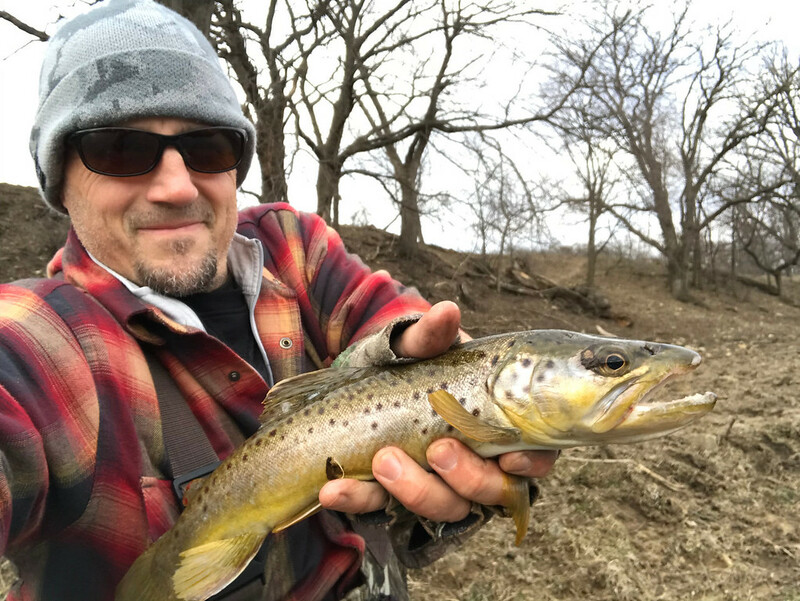 I'm going to do a bit of prospecting on Mad area streams that I haven't yet hit (most of them, LOL) and then depending on my luck, going to the standby's on Sunday, hoping most of the fair weather fishermen are at church or stocking up on food for the college championship game that evening. Actually, even on nice winter days I usually have most of SW Wisconsin to myself. The fish are definitely still in those small streams although if the water is really low and clear, they can be nearly impossible to find. They move out of skinny water though from my experience. Coz I can see everywhere in the stream when it’s low and clear and there ain’t no fish. If the stream has a foot or more average depth and then some deeper spots, they’ll be there. Getting them to bite is the challenge. Water depth is the key and there are some surprising deep narrow streams. I actually like the idea of more narrow water in tough cold water situations coz at least I know they are seeing my offering even if they won’t take it. Lots of dynamics at play in the winter time: water temps, sun, water levels, runoff - all need to be taken into account. Saturday is calling for progressively warming air temps throughout the day and lots of sun. 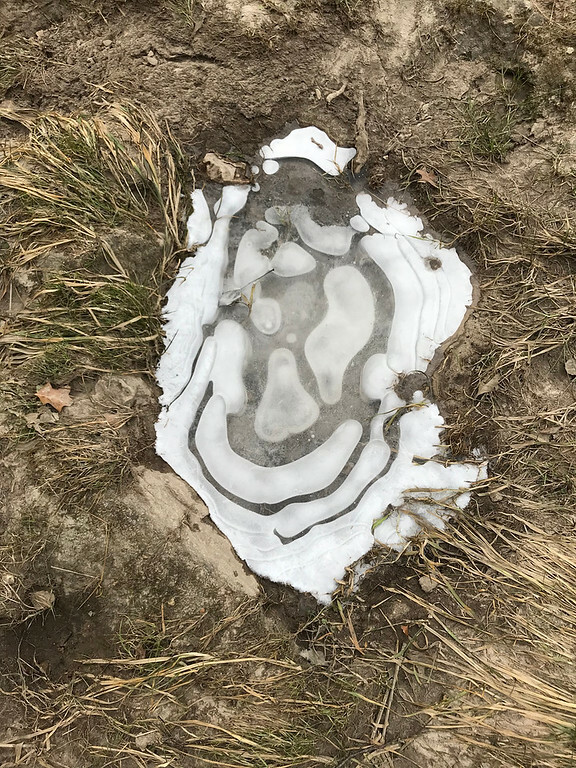 In areas that have plenty of snow on the ground, this will mean snow melt runoff into the streams which will either muddy things up, or lower the water temp and shut down Trout activity. 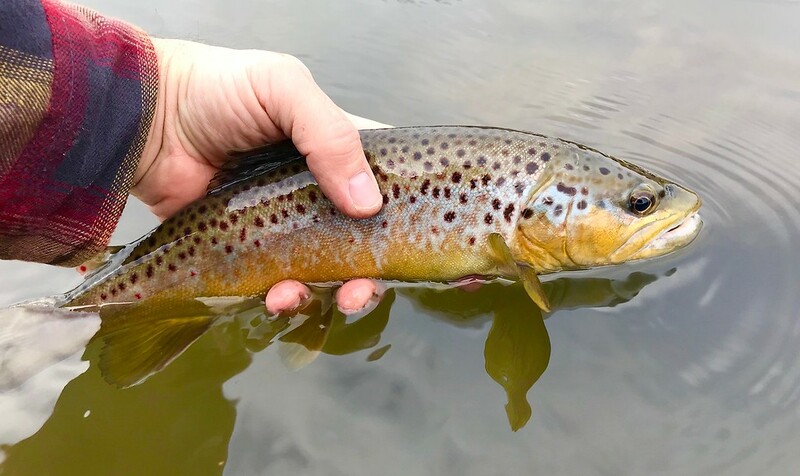 Conversely, if there is little snow melt, the rapidly rising air temp coupled with the sun will drive up the stream water temps and induce Trout to feed. We might even see some insect hatch activity, typically midges, although BWO have been known to occur. Snow depth maps are your friend this time of year. 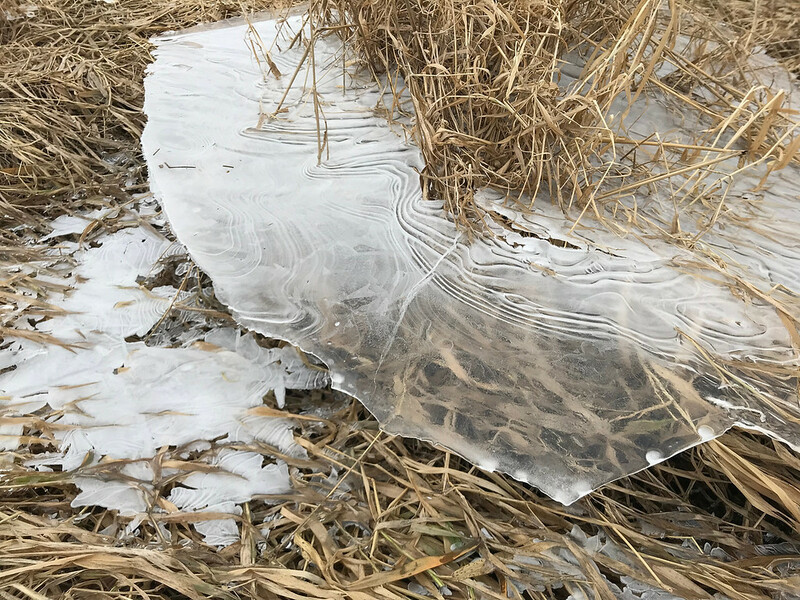 Creeks and rivers with large water basins are usually not a good bet in the winter, unless the air temperature has been low enough to ensure little runoff and stable water temps. 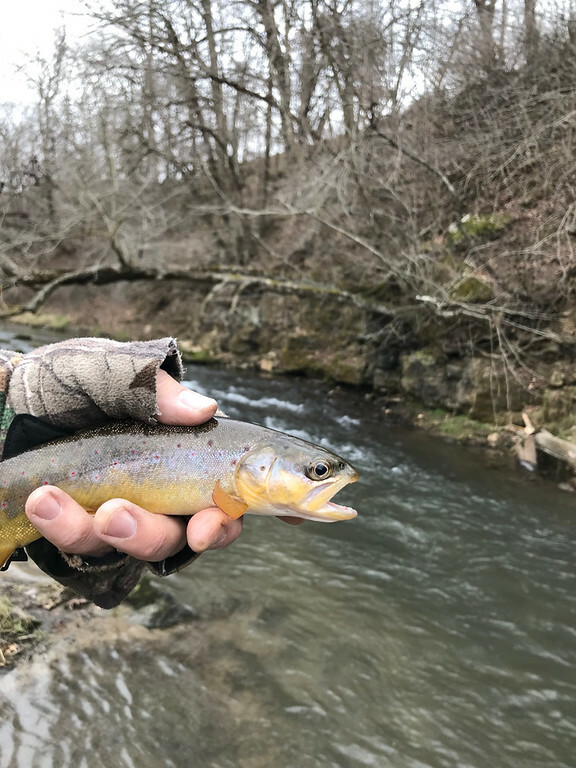 In my experience, most small streams do hold Trout throughout the winter time. If there's habitat, food and oxygenated water, Trout will stay put. Although a few years back one of my favorite small streams froze over solid for about four weeks. The following spring the fishing there was terrible and didn't rebound until the following year. 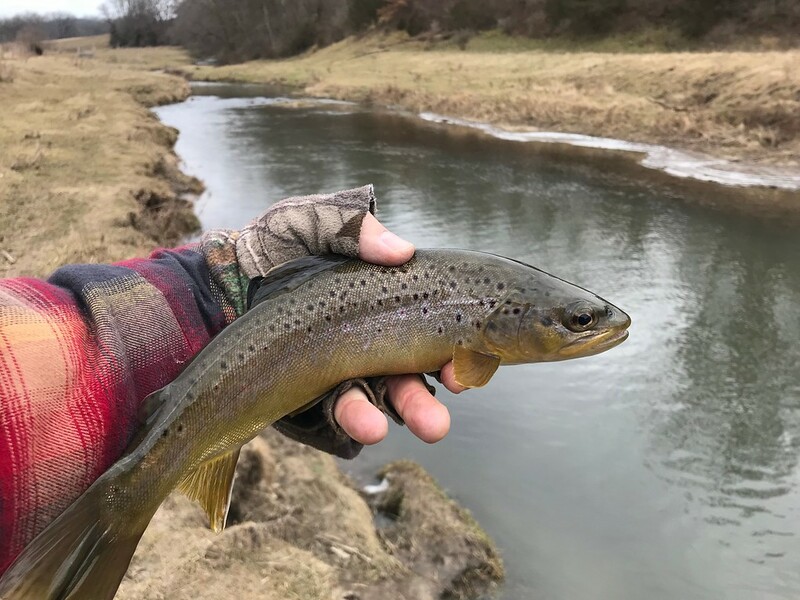 Creeks with spring fed ground water sources will do better in the winter as the water temps will remain well above freezing and sustain all the critters and bugs Trout need to feed on. Look for green stuff growing under water, a sure indicator or a spring or ground water seep. 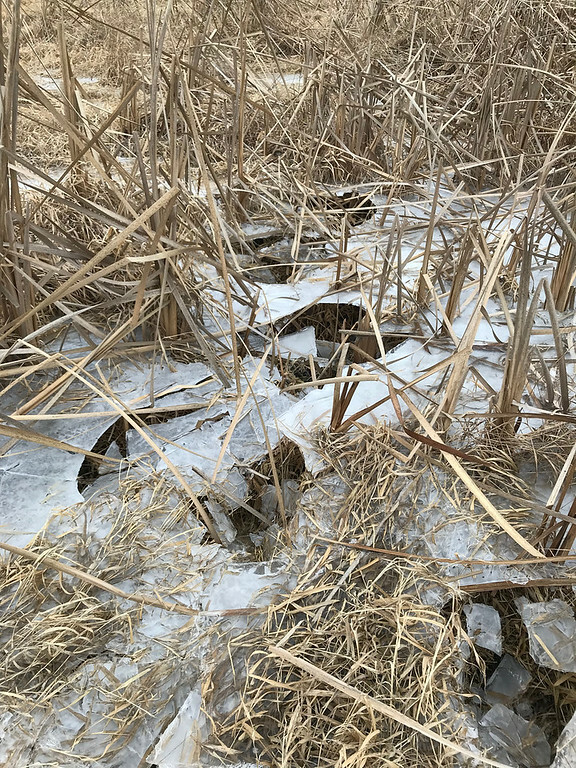 If the creek is frozen over and the water de-oxygenates, Trout will move out and seek more favorable conditions. 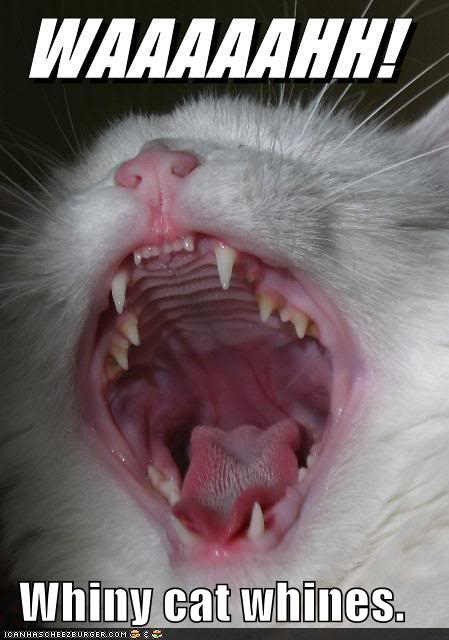 Edited by user Wednesday, January 2, 2019 6:21:53 PM(UTC) | Reason: damned typos! Got out Saturday on marginal waters dreaming of a biggun. 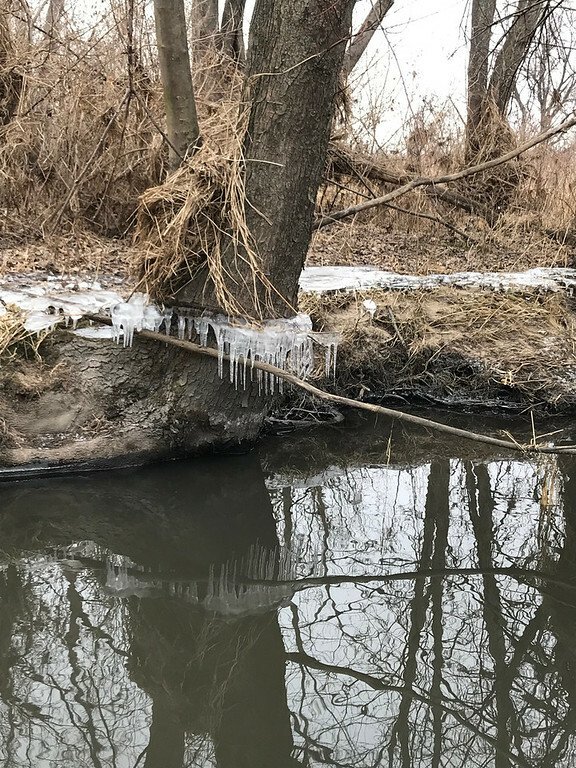 There was a crust of ice at the high water mark from the rain last week and it's a good 18 inches above the stream surface now. Cold, overcast and blustery day on marginal water and I didn't think it boded well for my prospects and I was correct. Didn't even see a fish in maybe a couple hours. No worries as Sunday was the day I was going to trouty water for a longer stretch. Went to an old favorite stream that I never got to last fall due to persistent high waters every time it came up in the queue. I've always fished it closing weekend and it was chocolate milk and over the banks last year. Just checked my log and the last time I fished it was July 12th. Was really excited when I arrived – like seeing a dear old friend. Corny I know, but true. Anyway… water volume was really good for January and it had a nice stain. The rains from last week certainly paid off. Practically skipped about a mile downstream to my starting point. Despite the fish count, it seemed slow or maybe inconsistent is a better way to describe the fishing. Was there around 4 hours and got 21 to hand, had at least that many short strikers and lost at least 10 that were on briefly but got off coz they either didn't strike with purpose or I didn't set the hook properly. Was a good day but a bit frustrating due to the missed fish. In addition, most of the active fish were the little ones – under 12 inches. Luckily, I got a few 14-16s towards the end of the stretch that rounded things out. Will say though that every fish hooked had a lot of energy and there were many an aerial display. In addition, was using my UL's, so I can feel even the little ones quite nicely. The "weird" part of the day was that the fish showed no rhyme or reason for anything that they were doing. 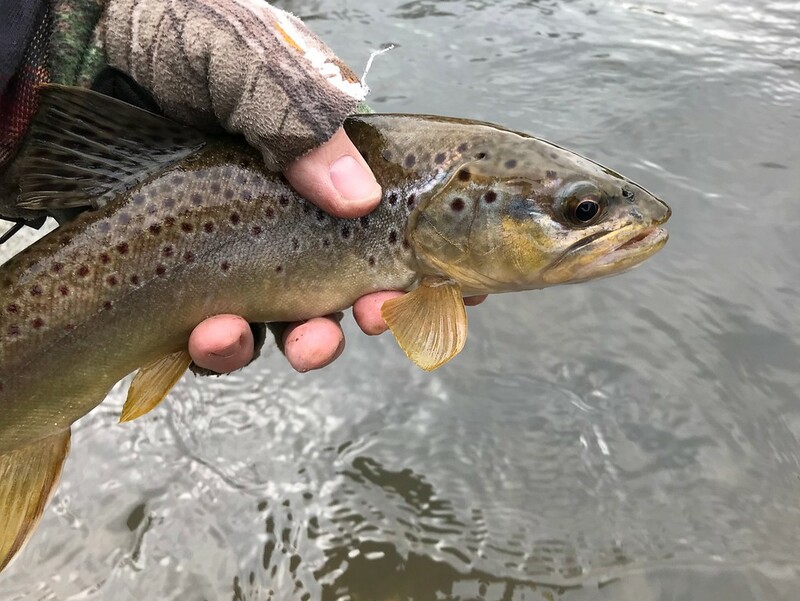 Hooked them in still waters (especially tail outs of pools), in riffles, right up in the drops and in runs – but nowhere consistently. Also – they didn't seem to be able to settle on what color(s) they wanted. At times, only black would work and then that would die off and only orange would work. After a long slow spell, switched to white and got a fish on the first cast and thought "Here we go, found it!" Didn't get another fish on white. Got a couple on gold blades too. Just kept switching as slow spells dragged on. Black and orange are the two that worked the most often. I believe that had the sun come out as was the forecasted… things would have gone bonkers. 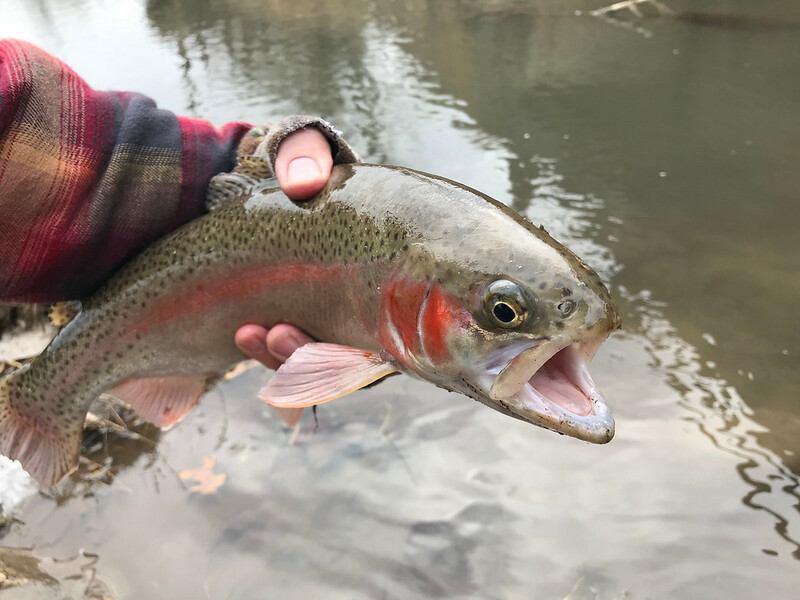 The stream just needed to warm a degree or two during my fish and all of those short strikers would have hit hard and more of the big fish would have activated. Give me those stream conditions in April and it's probably a 50+ fish day. Oh well... still a really nice January trouting in very pleasant conditions. Was perfect as I was never cold, nor was I overheating. Favorite "catch" of the day was this one (below) as I could tell I didn't have a good set and on a day when even decent fish are at a premium, you don't want to lose one that you have a shot at. Had the net partially under it and was reaching from the bank over deepish water when the hook came out and the fish dropped into the water. Reached further and scooped and was able to get about half of it and lifted. Fish was balanced on the rim for a pregnant second or two and then fell into the net. I may have yelled, "YES!!!" and then laughed at the cows that were looking at me in bored confusion. This was my favorite fish of the day (below) as I'm always a sucker for the hot rod flames or the burning belly color variant. As always, photo doesn't do justice to how beautiful that fish was/is. Never happy to hook a brood, but I always get a charge when that red/pink stripe first flashes coz it's always unexpected. This one fought really well and was fun. Thank you for your service, ma'am! Happy to get a fish count day in as I know that very soon I will be driven to go to low density areas in search of big fish and catch counts will likely be low and or sporadic. Actually… it was this one that was working... NOT orange. This was working in swift water – riffles and noisy drops. 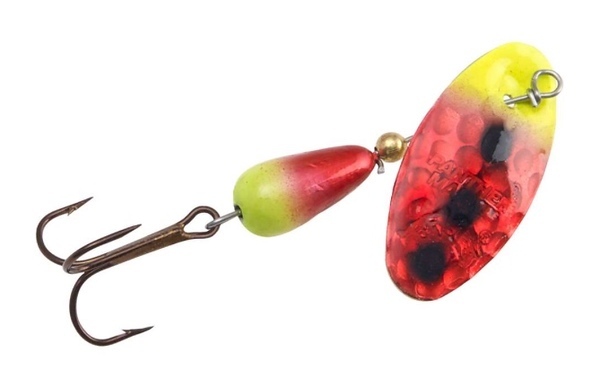 Did not work at all in quieter waters – the black worked better in those spots. Memory was jogged yesterday when I realized I didn't have any with me coz it was on my UL and I hadn't restocked my stream box. 2 users thanked Gurth for this useful post. I am heading out to the Driftless Thursday. I will hit my 2 favorite spots. One is where my friend "Frank the fish" lives. I have a question about a small stream one of you tipped my about. I am curious about how much damage was done during the floods. Can I name the creek, and someone here might know? Or is there a way I could look it up? Or should I just go there and see what's what? Don’t name it if it was a tip. I haven't seen any lasting damage from last year's floods anywhere south of the Wisconsin. So... if it's in the area of Frank's home stream, it'll be fine and if it's a small stream, it'll probably be low and gin clear and tough to find fish. Frank's home stream is in exceptional shape right now or was on Sunday when I fished it. Have fun!